TOP PHOTO, L-R: (top row) Chinchilly, Ballet Slippers, Cocktail Bling. (bottom row) Dress To Kilt, After School Boy Blazer. 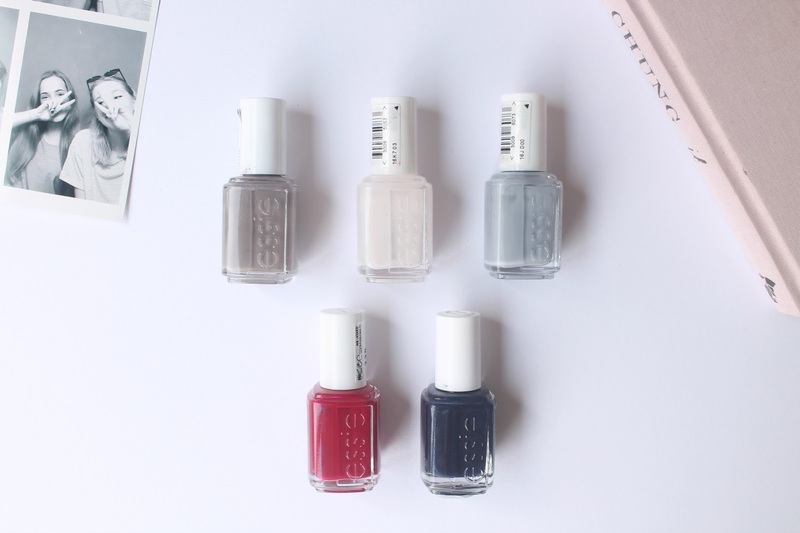 Unless you've been living under a rock for the past couple of years then you probably will have heard of the well known (and loved) nail polish brand Essie. Available in the drugstore, Essie is by far my favourite nail polish brand for affordable yet amazing quality varnishes with THE most incredible colour selection (I can spend a good twenty minutes mesmerized in boots. We've all done it, right?). I thought I'd share the colours I have in my Essie collection as although I don't have all that many, I feel like the colours I do have are a good basis to start collecting from. Most, if not all of the shades I own are quite dark so perfect for autumn and winter so I definitely be rotating these colours throughout the next couple of weeks and months. For all those inpatients gals out there like myself, I would definitely recommend these polishes for super fast drying formulas and also really pigmented colours meaning I usually only need two coats. Pretty damn good right? Also the staying power of these nail varnishes is another reason I always go back to them because they can easily last 5 days without chipping at all! Another great bonus anyone as lazy as me when it comes to painting nails.